Don’t panic Warhawks, but midterms are right around the corner and before you know it, we will be binge drinking espressos while trying to convince Anderson Library to stay open for a couple more hours while we cram for our midterm exams. 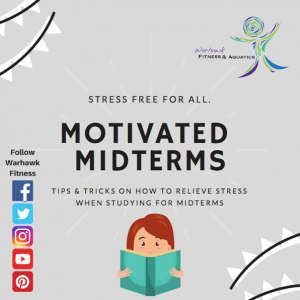 Midterm week is one of the most stressful weeks for students with all the cramming and studying of notes, homework, and anything else their professor provided for them for their exam. It is always good to remember to keep calm when studying for your exams, but how is one supposed to do that when they have five or more exams all in one week? Below are some tips and tricks on how to stay merry and motivated when it comes to studying for midterms. Almost everyone is worried about not retaining or not studying all the information they are given the night or nights before the exam. Individuals will stay up late hours of the night cramming everything they possibly can in for their exam. By going to bed late, the odds of an individual retaining almost everything they learned when they are exhausted doesn’t receive the best results. For individuals who want to improve their test scores, it is better to get a good night’s’ rest and go to bed early so you can be healthy, ready, and prepared for the big exam coming your way. The next tip that almost no one would think of is to spend time relaxing and doing something positive for yourself. Creating a feeling of happiness and calm makes an individual feel less stressed and more relaxed. Take some time for yourself and go to the gym, meditate, hang out with friends, or whatever it is you do that makes you feel less stressed and more relaxed. By forgetting about your worries and focusing on your relaxation, you can have a healthy mindset for the rest of your study sessions. The last tip I want to share with you is to manage your time and to plan ahead. Students who are on top of things and focus on what needs to get done by when can help reduce the amount of stress they can have. Use your planner or calendar to plan out when you should start studying and for what exams. Waiting and putting everything off till the last minute will only increase the amount of stress you can have. It is better to be prepared then lazy. Manage your time with each exam and make sure you spend a fair share of study time for each class. Better to be safe than sorry when it comes to exams. I know everyone is going to do amazing with their midterm exams whether it is with these tips or others. If you have other tips that you feel can benefit other students when it comes to studying for their exams, leave a comment below and tell us your thoughts! 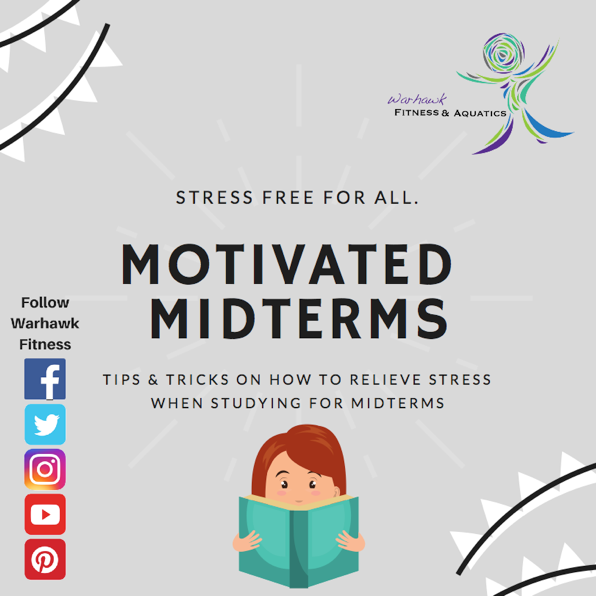 Stress has nothing on our motivated midterms Warhawks! Don’t forget, the Williams center is open for those of you who need a study break or who need stress relief. This entry was posted in Warhawk Fitness and tagged Emma, OConnor by Tyler Kloss. Bookmark the permalink.